Founded in 1952, White Dotte is located at the intersection of Route 38 and Route 206 in Southampton, New Jersey. White Dotte has been a family-owned business for the past four generations and specializes in the distribution and installation of car entertainment equipment, CB radios, public address equipment and all related accessories. Mike is the third generation owner of White Dotte. 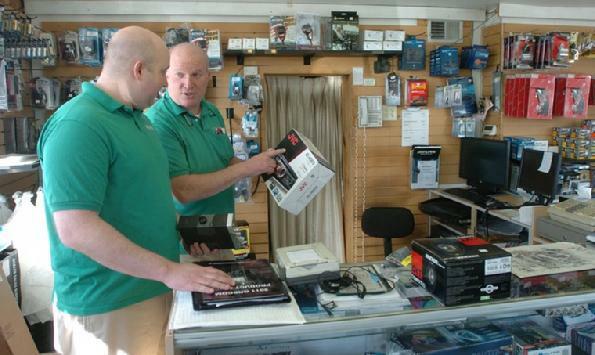 With over 30 years of experience in the electronics business and 15 years as White Dotte’s owner, Mike has the skill and know-how to maintain the business while providing quality service to White Dotte’s customers. As a fourth generation White Dotte manager, Chris prides himself on providing excellent customer service and his knack for finding the best possible solutions for his customers. He graduated from the Catholic University of America with a Bachelor’s degree in Finance. As a White Dotte installer for nearly 10 years, Rob is an expert at installing car audio and CB radio equipment and accessories. Rob is excellent at designing car audio systems and making his customers ideas a reality. He also repairs CB radios and other related accessories. At the age of 16, Carol started her first job, working at the dairy bar. After marrying Mike Green in 1980, she worked in nursing until 1988 when the opportunity arose for her to run the dairy bar. Carol is now the owner of White Dotte Dairy Bar and is always on the lookout for new flavors and ideas. The year 2012 marked White Dotte Dairy Bar’s 60th year in business.